Unisem corrected from 6-month high of RM2.32 on 24 December 10 to as low as RM1.81 on 15 March 11 following the devastating Japan’s earthquake and nuclear crisis. However, Unisem rebounded to close at RM2.07 last Friday, taking cue from the strong rally in U.S. technology stocks due to encouraging 1Q11 earnings and positive outlook guidance, alleviating fears of prolonged supply chain disruptions and diminishing demand. After surpassing above the 200-d SMA of RM2.03 last Friday, Unisem is likely on a new leg of upward to stage a decisive breakout above the upper Bollinger band or DTL (Down-Trend-Line) at RM2.09. A swing above RM2.09 would likely push prices towards RM2.20 (upper channel) and RM2.31 (38.2% FR – weekly chart), followed by RM2.46 (23.8% FR). Put a stop at below RM1.95 (uptrend line support). For leveraging, investors can also consider Unisem-WA (expires in Aug 2015) against the other two CWs, due to its decent gearing of 3.8x and better liquidity. 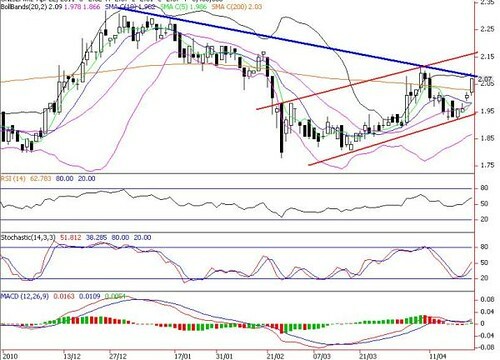 Daily Unisem Chart Shows It Is Likely To Stage A Breakout Above The Downtrend Line On Bullish Technicals. 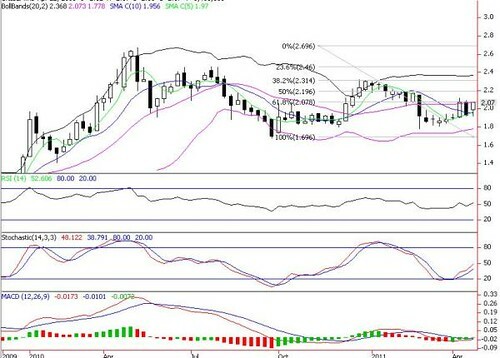 Weekly Unisem Chart: Short To Medium Term Target At RM2.20 - RM2.46.